As I've been ramping up my woodworking for this winter I've been spending some time on the top to the dresser. I don't have a lot of pictures mostly because despite it taking me two or three weeks to get it ready for the finishing room there's not really that many steps to it. I had started a top previously but gave it up. 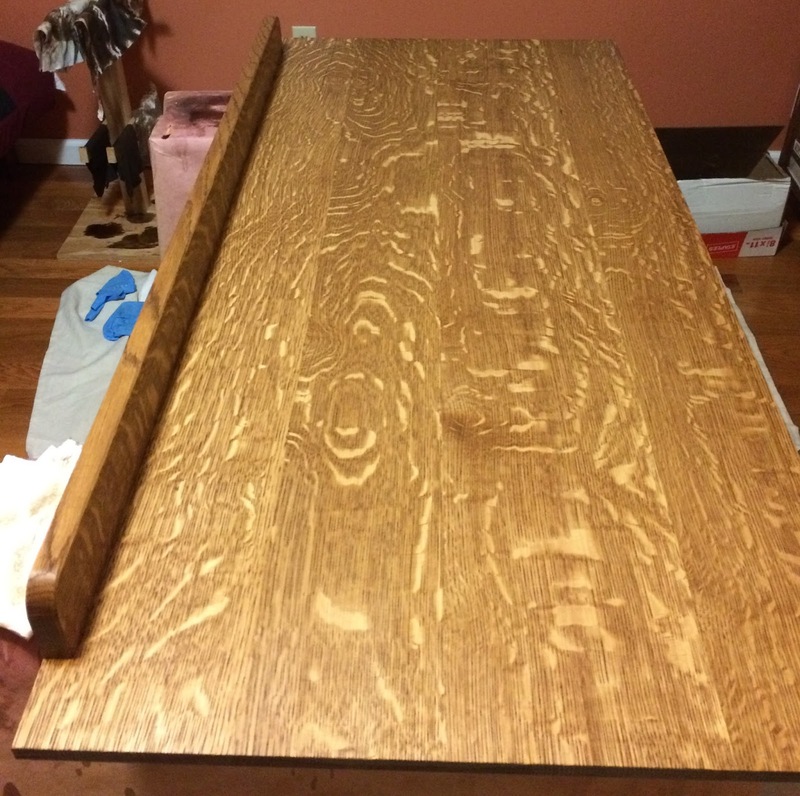 The top requires a panel glue up that is 21" wide and 44" long. 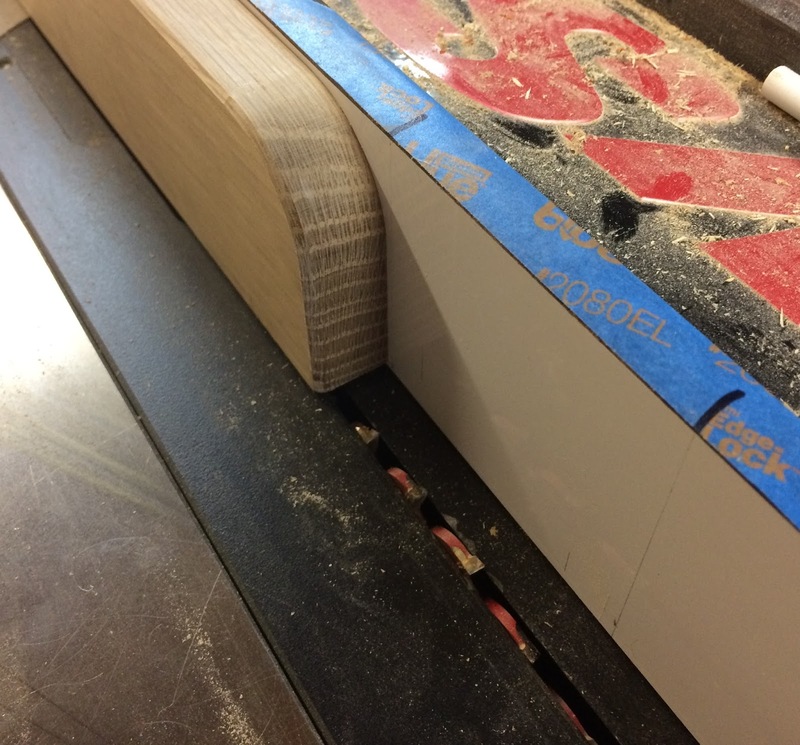 My plan was to glue up two pairs of board and to use my planer to make them flat again. 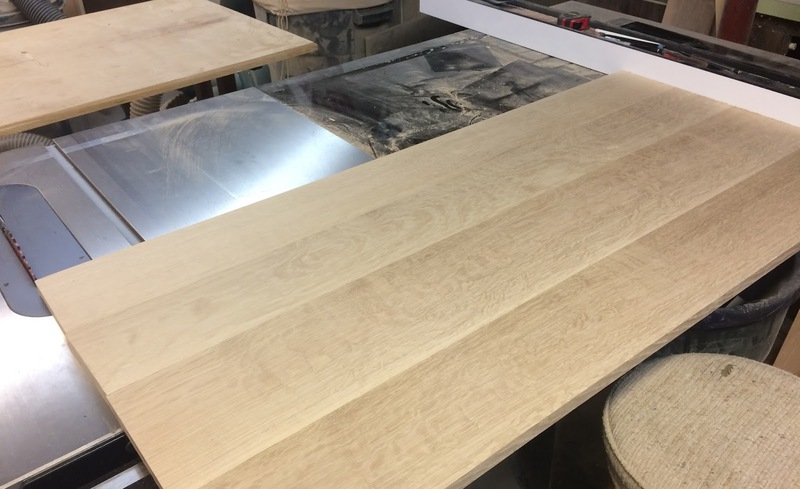 Unfortunately my boards had wild enough grain that there was no direction I could pass them through the planer without getting severe chip-out. Frustrated I gave up and used those boards for other parts of the project. This was probably two years ago that I had reached this point. The point I am at how is that the top is pretty much all that is left. Once the top is on I can put the back on - it's been ready and waiting for a year - and I can actually start using the dresser even as I finish the last few details. I decided to attempt to reuse two of the boards from the old top and I added two new boards. I followed the same process as I did the first time. 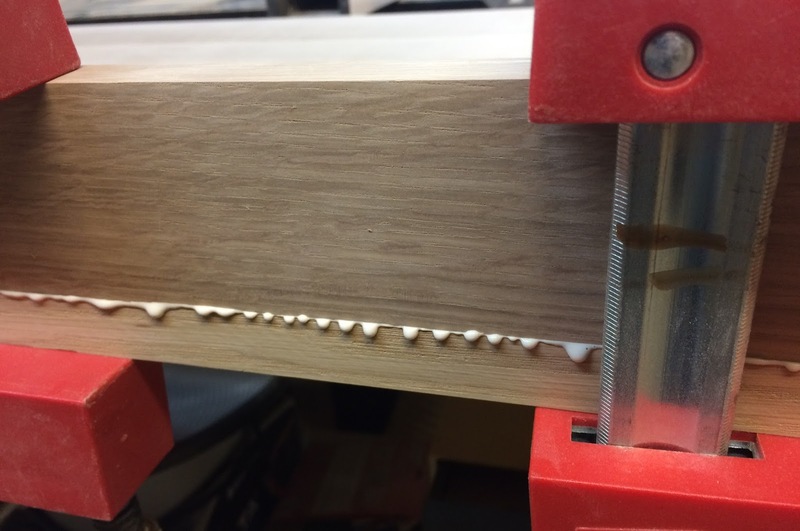 When the planer started chipping the boards I tried a technique suggested to me by one of the clerks at Woodcraft which is to wet the tops of the boards with mineral spirits to soften the fibers and then send them through the planer. This was a horrible idea. The first board passed through without any issue but the second board got stuck halfway through. When I stopped the planer and took a look at the board I saw black rubber marks on it. The rubber from the drive wheels on the planer was being dissolved by the mineral spirits! GAH!!! I unplugged the planer, lifted it to its maximum height and wiped the rollers down with paper towels as best I could. I then let it sit for a day to finish drying. It's a quite expensive planer and I don't want to replace it because I do something dumb. Fortunately when I ran some boards through it the next day it all seemed to be fine. But I have a new tool! I pulled out my new drum sander and it did a stunning job of removing the chipping from the boards. It took three or four heavy passes and the boards were then flat and chip free. The next step was to glue the two pairs of boards together to make the full glue up. I took great care to get the boards to come out as even as possible. What little difference there was I removed with hand planes and my random orbit sander. 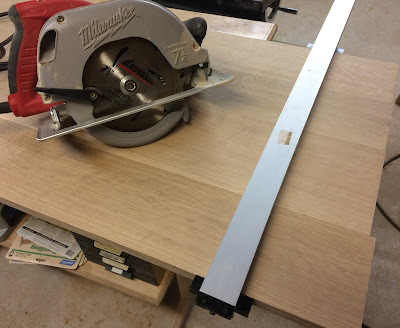 I used my circular saw and a straight edge to true up the ends, then I used my extra wide fence on my table saw to trim both ends straight, true and clean. The top needs two more details. 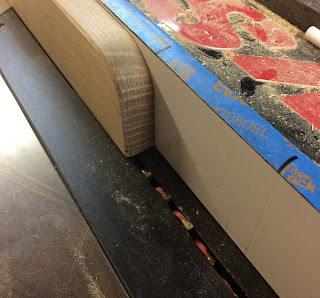 It gets a 1/4" bevel on the bottom of the sides and front and it gets a back rail. I used by 2 1/2 HP Dewalt handheld router and a large chamfer bit with a guide bearing to take small increments - about 1/6" each - until I was down to the desired depth. I'd made the back rail while the top was gluing. It's just another quartersawn white oak board that gets a 1/16" bevel around the top. After chamfering the top and the back rail I glued the two of them together. One of the things I did to minimize glue squeeze out that I'd have to scrape off the front was to put a stopped groove on the bottom of the rail. I did this by setting my table saw fence to set the blade just a little inside the the thickness of the rail. I raised the blade so it'd make very shallow cut and marked the spot the blade entered and exited the top. This allowed me to drop the rail onto the blade, push the rail through until I hit the stop mark and then turn off the saw. The glue up went well. I had plenty of squeeze out in the back and only a small spot to cleanup in the front. The groove worked. It was later that night when I was thinking about the next steps that I realized I hadn't trimmed the width of the top yet. 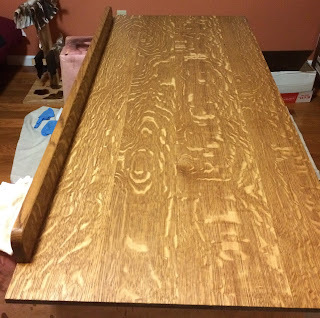 When I measured it I had a 22" wide board and it needs to be 21. Simple enough to fix. I just ran it through my table saw and reapplied the bevel to the front bottom. After that it was a up to the finishing room where I could wipe the dust off with mineral spirits and apply my Watco Dark Walnut Oil. 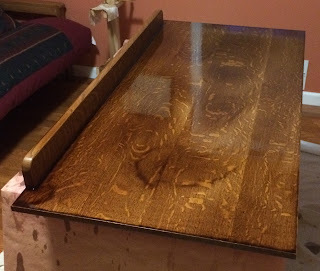 After two coats of oil I wiped the top down with shop towels until they came back mostly clean. So far I'm pretty happy with how the top has come out. It's flat enough - not perfect but good enough. I kind of wish I'd remembered to put the wide board on the outside so when I trimmed the top to size it would be closer to the same size as the other boards. But, I'm happy enough with how it looks.